The first half of 2014, more or less, was notable as the last phase of my five years as a caregiver for my mother. By that time, her existence was becoming very thin and tenuous. Her waking moments were few, and much likelier to show signs of pain than joy. Her ability to interact with her environment and in particular other people was becoming extremely constrained, limiting drastically my ability to contribute to her life even in small ways. My attachment to her was pretty much off the charts, even as mother and child relationships go, but my overwhelming emotion at her passing was relief, for her sake and mine. The period of tears and bereavement happened five years ago, when her mind lost its capacity for nearly all of the things that she was and that she loved. I had years to think about what I would do afterwards. The occasion presented quite an opportunity, when you think about it. Often, people will say, "If I had my life to live over again …" I really am having this chance. My three immediate goals were to resume active piano playing, to pick up my art work, and to pursue a program of physical exercise. The first two of these have gone extremely well. The last was delayed because of some injury I had during the course of rebuilding my garage, very likely a cracked rib, to judge from the symptoms. I'm picking up the exercise goal with the new year. Of course, it's a cold and sometimes icy season, which adds a wrinkle. But that's part of the reality. There are some bigger picture goals, which will probably take two or three years to begin to play out. Slowing down the tempo of my life has been a big adjustment, one that I'm not through with yet. Another challenge has been that my brain is not at its best late in the day, so evenings need less intellectual activities. Presumably these things will gradually be worked out as time goes on. Christmas 2014 is notable, perhaps, as the second in my life that I have not spent with my mother. Whatever else in our lives changed, it was always a time we spent together. The only other time was exactly forty years ago, in 1974. 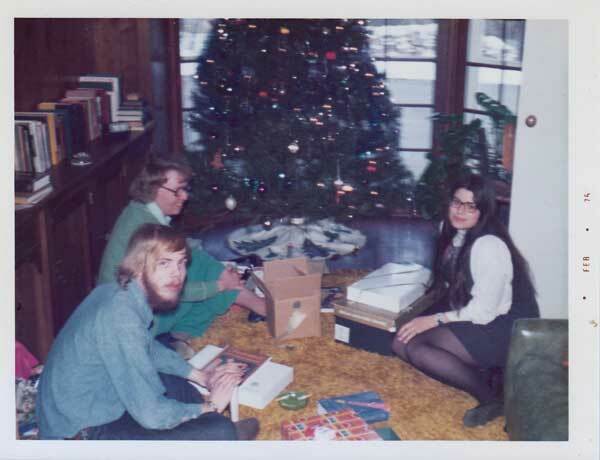 There was not enough money in my life to buy Christmas presents, let alone to fly from Boston to Milwaukee to visit. My brother, Peter, carried on his plane trip my handmade gift, a wood sign saying, "Nordberg / 999 East Quarles," for the house my parents had recently moved into. As it turns out, it was not a bad gift, outlasting my family's stay there. That's Christmas Past. Christmas Present is very rainy, with temperatures into the 50's. I have plans for trying a new recipe. Christmas Future is a gleam in my eye, or rather, a number of gleams; I usually have various schemes developing in my mind. We'll report on all that once we have a chance to see how it plays out. The tentative work in oil painting I started during classes this fall seems to be sticking. This last month I have done a view out my kitchen window, working at a much more deliberate tempo. I am relatively happy with this piece, without having any illusions about it. I have a lot of miscellaneous technical practice and skill, but no good idea of where I want to go with it. So far, I am identifying a few things about what I do. First, I like textures. Second, I am finding that looking at the reality more often supplies solutions to artistic problems than anything I create. Third, there are some wonderful visual things going on around us that are worth paying and calling attention to, which are of far more value than the bare act of copying. We'll see where it all goes. Many years ago, a five year old gold remarked to me, “Laughing is like crying.” It is. The two sound much alike, and they are both strongly social acts, appeals for the empathy of those around us. Crying often calls for action and assistance. Laughing says, we share a good understanding of a thing or event, and frequently, we disbelieve and shun a particular misunderstanding: “Your head isn’t a hat rack!” Laughter by a lone person is generally taken as aberrant behavior, perhaps even more than a lone person talking. Laughter, even canned laughter, is very contagious, and we may become suspicious of a person who doesn’t share in the reaction. Laughter is often considered to be the product of humour. However, laughter is a social emotion, occurring most often in interactions, where it is associated with bonding, agreement, affection, and emotional regulation. Laughter is underpinned by complex neural systems, allowing it to be used flexibly. In humans and chimpanzees, social (voluntary) laughter is distinctly different from evoked (involuntary) laughter, a distinction which is also seen in brain imaging studies of laughter. The paper notes that people more often laugh when they are speaking than when they are listening, which seems right to me when I think about it. I suspect they are right that there are two different “flavors” of laughter, just as there are different kinds of smiles: the deliberate smile intended to create certain perceptions and reactions in the listener, and the more passive Duchenne smile of true content with our situation and environment. Both varieties (of laughter and, for that matter, smiles) seem like good ideas. 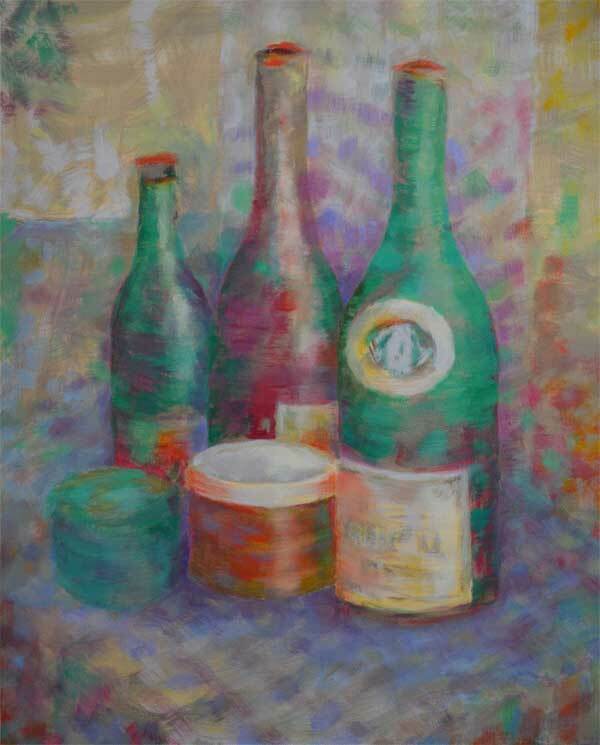 I have signed up for an eight-session class in oil painting at the local Montserrat College of Art. Oil painting seems like a good thing for me to pursue, and the timing is right. I have basic abilities in mixing and applying paint, as well as in drawing. I don't have good notions of how to select a color palette or of how the texture of brush strokes might relate to a finished whole. The instructor seems to have ability in these points, though of course my solutions would probably end up being my own rather than hers. Still, it seems intriguing. I am looking forward to it. Classes start in October. I have started to do some pastel sketches before the class starts next month to help me think about my goals. I am comfortable that I can make a reasonable representation if I want to, but there's little point in that. Megapixel cameras will do a much better job than I will. I am thinking about questions of palette and texture. The first pastel sketch is deliberately just copying the basic appearance of the subject. The next one, I will try working with a more deliberate and restricted palette. In this second pastel, I'd set aside ideas of experimenting with surfaces and textures, which actually I am quite interested in, planning to concentrate just on revision and limitation of palette. I hadn't thought that the palette limitation would feed the surface question, but it certainly did. 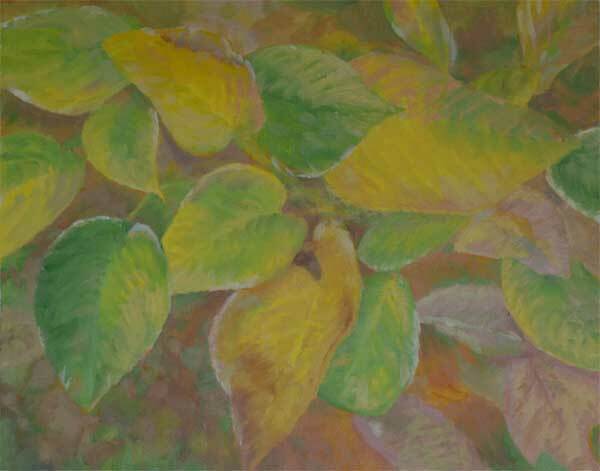 Now that I see it happening, the drop in the contrast between the foreground elements and the colder background leaves our eye much more aware of the variations within the foreground. In retrospect, this seems rather an obvious point. Now that I've noticed it, let me see if I can begin to use and control it. A third iteration is built up, in a loose fashion, from a broader color palette: rather than brown, adjoining areas of red and green, perhaps yellow and purple. Again there is an unintentional but desired point of learning, which is that the more contrast within the local bits of color, the more important it is to have a consistent "stroke." And again, it is obvious in hindsight why this is so. Unfortunately, pastels are not ideal for control of texture. At the moment, I am not sure about the implications of all of this for future directions, but it has been useful. I will be interested to get the instructor's and other people's perspectives in the class. 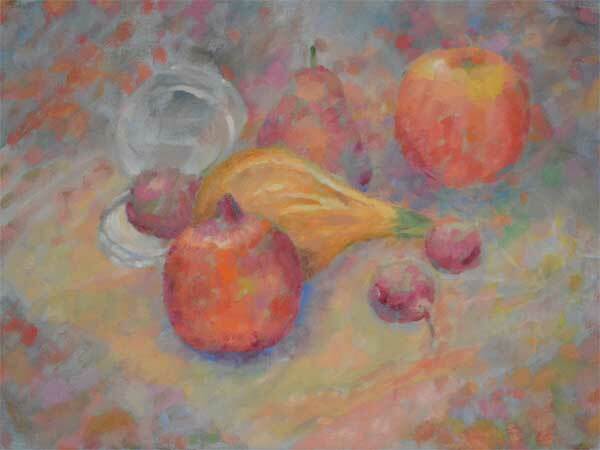 Here is the first still life from the class, in the state after I have worked at it at home for a few days. I am not sure if I will continue to work at this in the second class, as planned; perhaps it is "cooked," so to speak, and the thing to do will be to start another version. I am clearly interested in surface and texture, that much is clear. A second take is in a different palette with a much less complex background. In the aim of getting the foreground and background to interact, I ended up putting light coming from various inconsistent directions. It does seem to help things a lot to work at keeping brush strokes of a consistent character, though that probably won't be very evident in a small electronic image. This has a background that is active but not strident. 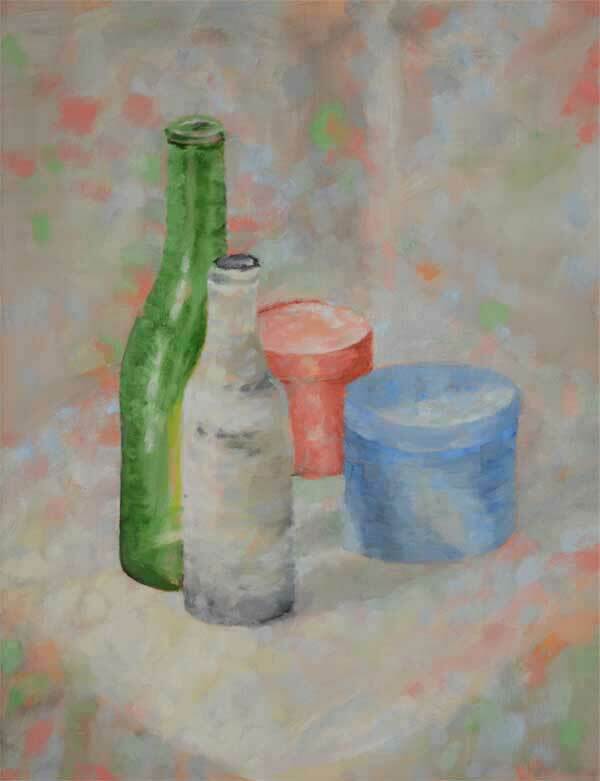 The edges of the objects are less stark and severe than in the previous piece. The composition was not very good to start off with; there is too much empty space around the foreground objects. All in all, though, it is coming along, bit by bit. This study is a filler, done outside of class. I am thinking about composition, which has been a tripping point. The fall hostas are fascinating to look at with their variegated colors and random frost injuries. That's hard to paint, because the areas of color don't go along with the shapes or masses very much. I think it's moving forward, though not in a straight line. Still, two steps forward and one step back is progress, if you keep at it. 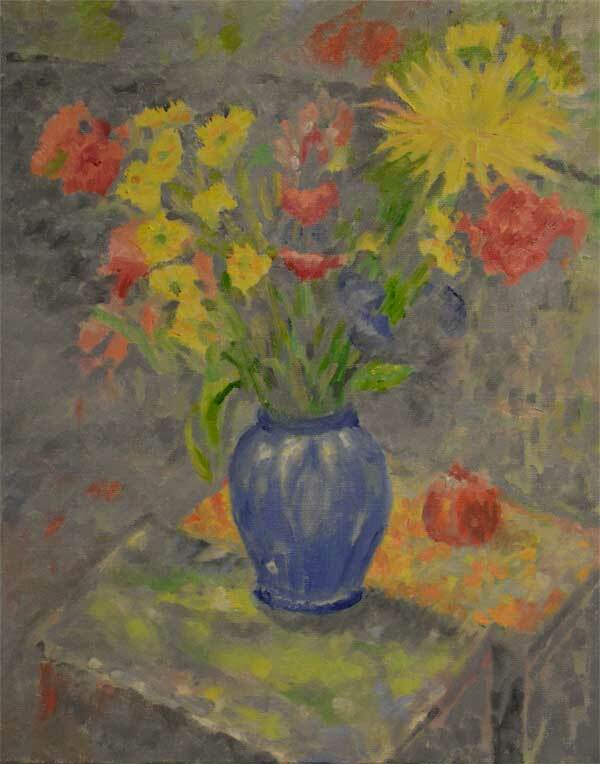 Flowers were my mother's thing to paint. I can see why. They are fascinating, and forgiving subjects in many ways. If a petal or leaf isn't exactly right, no one will be offended or probably even notice. I have never really done a flower painting before during my adulthood. There's much more distance to cover, but I do think it is coming along. The exercise for this session was to paint with a palette knife, rather than a brush. People took this as meaning that part of the painting should be done with a palette knife, but they used brushes extensively, especially for anything in the foreground. I did everything with the palette knife. At the moment, I am as satisfied with the outcome as with any of the pieces I have done in the class. Whether that's a matter of the tool used to apply paint, or increasing experience, or simply chance, or my mood at this moment, I can't say. I do like the character of the strokes, the directionality that started to arise, and the combination of additive and subtractive color relationships. 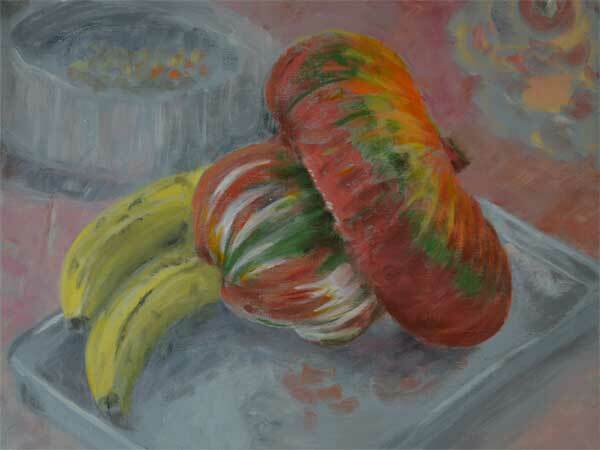 The turban squash was such a colorful and variegated thing in itself that I lost all intention of doing anything other than following its shape and surface. Without having planned it at all, I did a very different kind of painting from the ones before it. In a way, I feel silly writing about such ordinary things as raking leaves. Won't people wonder, "What does this guy have to think about? Get a life!" And there are special chores each season. For instance, this year it was blocking a small unfinished area of the eaves through which squirrels were beginning to find their way into the attic. I am even so far ahead of the game that I am preparing for winter. I broke down this year and got a snow blower. Whether it will snow much this winter, remains to be seen. But eventually it will. This very modest house, one of a series, was distinguished by its Italianate features, popular at the time. These included wide overhanging eaves and arched windows, often in pairs. In previous years, I'd replaced all of the old windows of the house, one or two a year. That made an enormous difference in energy efficiency, as well as neatening up appearances significantly. Replacement windows with arched tops took a bit of doing to accomplish. Accomplished it is now, I am happy to relate. They do look nice and have the additional advantage that the sash is operable, so I can get a cross breeze when it's warm. In the time after the recent severe storm, I noticed that a very large spruce tree, very close to my house and my neighbor's, was partially uprooted and leaning toward the houses. It is extemely fortunate that things stopped where they did, or I might not be around to tell the story. Because the lean of the tree increased visibly from the time I first noticed it, I got in a tree crew to take care of it on an urgent basis. They were amazingly good at such things and had a lot of equipment. They used a 100 foot crane to lift it up, a section at a time. It was amazing to watch the coordination between the crane and the man aloft with his chain saw. Beside the crane, they had a truck to life and haul the logs, a chipper truck, and a man lift that they didn't use. 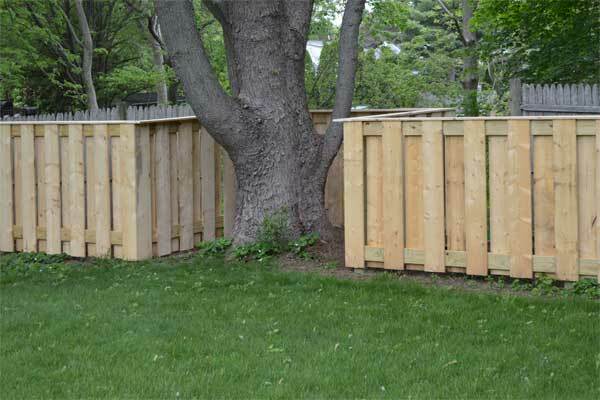 It was not cheap, but the price was entirely reasonable for the work entailed. 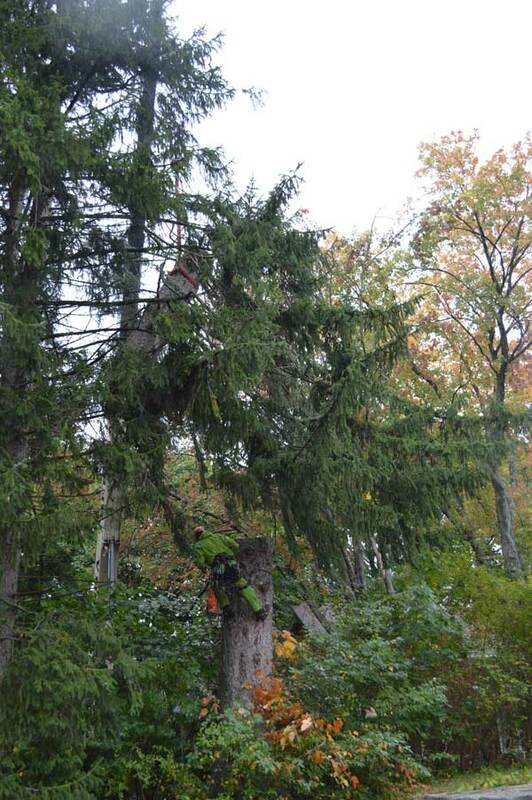 The tree was about 80 feet tall, 30 inches in diameter, and some 75 to 80 years old. I will miss it. This last Saturday evening, we had a storm that I think was as severe as any I've ever been in. The National Weather Service classified it as a microburst, a new word to me. Although the mechanism is different, the winds are like those of a small tornado, eighty to ninety miles an hour. I was close to the epicenter. There were several significant tree events around my yard, which broke 8" maple limbs like matchsticks. Luckily, none of the debris here hit anything vital. Others were not so fortunate. There were sustained power outages, some damage to property, and at least one fatality. There's an article from the Ipswich Chronicle that you can look at. At 3:58 p.m. on July 28, my mother stopped breathing. There was no transition. One moment she was breathing, the next she wasn’t. People whose thoughts I value warned me that nothing could prepare me for how I would feel once it happened. In the event, over the last month, I have felt a few moments of void and panic, but my overwhelming reaction has been relief. I don’t think I am a cold, uncaring person. If anything, the closeness of my attachment to my mother was pretty much off the charts. I think what it is, is that my bereavement has been going on, inch by inch, for the last five years, as my mother’s mind and body became more and more paralyzed, unable to move, communicate, interact with her environment, swallow. People are generally poorly equipped to understand dementia, especially in its end-stage forms. They think that perhaps the affected person is forgetting where the car keys were, or that the person just needs to be corrected and then will snap back into clear thinking. Toward the end, one nurse triumphantly and gleefully reported as proof of my mother’s well-being that she was resisting care. That really made me sad and, truthfully, rather angry. (I said nothing to the nurse involved.) If all the emotion left that a person can feel is primal resentment at not being left alone, which really doesn't seem like too much to ask, should we feel pleased that we can prolong the state? – pride that we’ve evoked an emotional response? I have deliberately kept an obsessive focus on getting my garage work done for the last few weeks, thinking that the best short-term plan was to keep my hands busy. That was probably a reasonable plan. At this point the urgent phase of the garage is close to over, and I will shift my attention to a variety of other activities. I will tentatively try out including some unstructured time just to smell the flowers. We’ll have to see how it goes. I do firmly believe that spending the last five years caring for my mother was the right thing to do. Now, I firmly believe that the right thing will be taking care of me… and others around me. As my Aunt Betty remarks, today is the anniversary of my parents' marriage. Two months since, at 3:58 in the afternoon, my mother took her last breath. Looking back at the many photographs I took during this period, I am amazed that I did not see how much her appearance was aging and sinking, from smooth and full contours to wrinkles and pale gray. I knew her functional ability was changing dramatically, but I did't really appreciate how she looked. As for me, I knew beforehand that having thirty more hours a week would be a change and challenge for me. It has been. I am starting to get used to new routines – for instance, an hour at my piano is barely enough to do what I would like to – but it will take a while longer. I have a lot of things I would like to do, but the reality is that I have a lot of energy in morning, but much less desire for heavy intellectual things in the evening. After a loss, people will often be experience a burst of emotion at the "first" something afterwards: the first major holiday or birthday, the first anniversary. As it happened, the strike at the local grocery store chain began just as it became clear that my mother was actively dying. This morning was my first full trip back there. On the whole, my emotions about my mother's death were stark bereavement a long time before her death, and overwhelming relief afterwards. But one of my caregiving role activities was providing food. Obviously the nursing home would have fed her at the mealtimes when I chose to, but food represented a primal tie, for me and for other caregivers. It was also, as with traditional family meals, a regular time to be together. I felt sad in frequent aisles of the store where I was used to getting things especially for her. These pangs were brief and much less strong than some of the other initial throbs. The sad moments - and they are few - are becoming milder. The garage door is in, and electrical work is scheduled for Monday. There are a few odds and ends left to get things reading for a framing inspection by the Town. I expect I'll get those done this weekend. After that, I expect I'll wrap the structure in Tyvek but put off siding until spring. 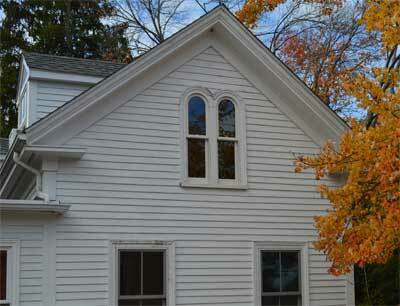 I could get the trim and clapboard done before winter, but there are many other good calls on my attention. I do need to get rid of the trash before then. 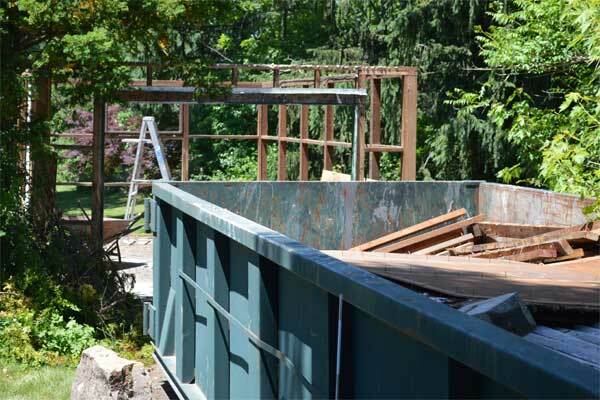 The garage is now gone, and the dumpster full to within inches of the top. Boy, that material was very dirty, smelly, and deteriorated. It will be very good to have it finally gone. I am glad to see that removing the structure opened no enhancing or highly desirable vistas, so rebuilding it in the same location will take nothing away. Taking down the existing garage was much slower a project that I had imagined. The roof boards were knotty and fibrous, very cheap material, but nailed down with a zillion nails. That meant that the roof couldn't be easily taken apart, but had to be persuaded, joint by joint, to let go of its hold on the past. I’ll be introspective and retrospective for a bit. I know that isn’t a good recipe for the long term, but for the moment I hope it’s at least understandable, if not productive. I am thinking of moments of my mother’s life that have made me feel very sad, which I recognize are likely very remote from what she would list as her unusually sad moments. The most recent was on May 2, when she said, “cold” as she was being made ready for bed. That was probably the last intelligible word she said, beyond a few syllables that basically equated to a “no" of disapproval for care activities. At that point, "cold" was an unusually long and articulate speech for her. Her feeling cold was real but moderate and momentary, not a big thing to be worried about in the scheme of things. I guess what seared, and still sears every time I think of it, is the loss of communication with her fellow creatures for this garrulous, sociable, hyperintelligent lady. A second was her recounting to me, ten or fifteen years ago, an episode from Peter’s boyhood. With her help, he had constructed a pride-and-joy landscape of papier-mâché for the model trains in the basement. At a birthday party, he and his young friends became very excited and, for one reason or another, decided to destroy it. This was not hard, since it was papier-mâché. She recounted that he was very sad afterwards, which is hardly surprising. The hard part is that she continued, “I didn’t know I could stop them.” This would have been so easy for a minimally assertive parent and host. What is sad to reflect, is that midway through her existence as such a wonderful mother, she had such a vulnerability, one that could so easily be – and was! – remedied. A third is her note in her diary that on one of my Christmas visits, I had not said anything about a part of her recent art work. It is one of those regrets that, as David Brooks remarks, we have more about things that we didn’t do than about things we did. Of course it would have been so easy for me to say a few words. I missed that this was something she particularly cared about, and it would not have been part of her nature to surface her hurt. I suppose these sadnesses all reflect simple things that were missing from my mother’s life at one time or another, for one reason or another. And the moral of the story is – well, I don’t know what the moral is. It’s been a week since my mother died. It was a very busy period initially, between moving her personal belongs at the nursing home, burial arrangements, and contacts with family members and friends. Because so much of that was preplanned, it went as smoothly as it could. Those chores are just about over. There’s still a bit to be done with the personal belongings. I made it a priority to clear away the sad reminders of her debility, from the thickener for drinks to the clothes of the institutional period. There is still a closetful of good clothes that I will arrange to take to a charity during the next week. But I really want to end up with physical signs that cover her whole life, over ninety percent of it one of beauty and joy. The last years were part of her life too and should have a place, but not a disproportionate one. There have been searing moments, as is to be expected. The time of 3:58 p.m. the day after was a stark one. I have learned that for a little while I will want to be careful not to have long evenings of unstructured time. I have plans for how to use the extra thirty hours a week that I now have. I’m sure that things won’t go exactly as I’ve imagined. Little by little, I will try things out. Right now, my concentration is shaky, so some of my more intellectual pursuits are off. Fortunately, I have a big physical project in working on my garage, which will keep my hands busy for a few weeks. Over the longer term, there will be a void that will never quite be filled. My mother is the last of my immediate family, and she and I were unusually close, even as mother/child relationships go. I hope that other human relationships will occur and grow. I would be the first to say that the last five years have taught me much about the value of the milk of human kindness. I was struck in the memorial comments about my mother how many people remarked that she could tell what they were about to say. That attention and empathy are skills that I will try to learn to emulate. And written in her diary, my mind has started to fade. The years then were hard. Now her struggle's recessed. The morning's Times; for hours, painting in oil. And wanted simply to sleep and have peace. By the last of it, her days had become merely dreary. The joys and loves had gone. Time for release. My pangs will fade, but remain a hollow. J.S. Bach wrote an early Capriccio in B-flat major, BWV 992, "On the Departure of his Beloved Brother." The occasion for that was his brother's departure to join the army, not his death, but the title lends itself to the current sense. At this point, my mother can eat, haltingly, and respond to painful stimuli. For the vast majority of her hours, she sleeps. For the moment, let's set aside the basic truth that being a caregiver isn't something one undertakes for one's own benefit. I do have my emotions about it, which seem to be more calm and positive than most other people's. We're all different, and I've been doing it for a while. Some people struggle with an overwhelming feeling of "stress." Others are hurt by a loved one's inability to recognize them. That didn't bother me, and in any event things were at that stage long ago. What was most searing for me, once I settled into it, was the thought that so much of my life's experience, with only my mother remaining to share it with, now could no longer be shared. That was a few years ago, and the throb has (mostly) subsided. I'm again having a marked emotional reaction lately. For the last while, at least I could communicate with my mother non-verbally. We could "chatter" back and forth, we could smile and laugh together, we could hold hands, I could stroke her in ways that I knew would reassure her. Those modes are gone, with infrequent exceptions. She doesn't respond to my voice, doesn't track my presence with her eyes, doesn't respond to gentle touches, and doesn't hold onto my finger if I put it in her hand. She is is the classic Alzheimer's textbook stage when the individual has lost the ability to interact with his or her environment. I feel confusion, to be sure, about my role and what I can do for her life. But I also feel a selfish kind of loss of the last interactions with her (saving, perhaps, feeding her, even that with her eyes often closed). Let me stop to remind myself, once again, count your blessings. As I walked outside at lunchtime today, I saw a girl of about 10 being hoisted into a wheelchair van. She was crying out inarticulately in pain and fear from the process. Obviously she had a congenital brain defect. Her functioning was about the same as my mother's is now, but the young girl did not have the chance for 80 years of delightful life before it. And her family would not think, she will be gone in a little while, but wonder, what will she do when we're gone? The wind is from the east, which is unusual in that prevailing winds are from the west. That's the way the world turns, after all. The jets bound for Logan Airport (in Boston) and Beverly Airport (much smaller) usually approach from the sea, so as to keep things quiet below. Now the flights for Beverly are coming in directly overhead. There are frequent roars overhead here along the shore, where we're unused to such things. I understand. Planes are less good landing with tailwinds than with headwinds. So are birds. Curiously, the birds' usual chatter is entirely quiet. They know something's up that's unusual with the weather, and that it might be best to batten down and keep close to harbor. The birds' silence and the jets' roar are an eerie combination. Since I lost 35 pounds in the first six months of 2011, I have had once-a-year cheeseburgers, usually around the Fourth of July. Last year, I didn’t even enjoy the special “forbidden fruit” and decided I wouldn’t repeat the custom. I relented a few months ago this year when I saw a recipe for cheeseburgers from ground pork with plum and onion bits. That sounded very good. It wasn’t, and it left the kitchen very smelly and greasy. I clearly felt much more interested in another slice of this week’s pizza, calamata olives and crimini mushrooms with gouda, and of course good olive oil. In the line of meat, I think I may make turkey loaf again when next I have time and it isn’t too hot. I have a recipe that works well for both my mother and me. The astute reader will already have deduced, from multiple Las Vegas-like notices on my home page and similar browbeating, that I have been deeply involved with my mother's care for the last five years. I will provide a link to the news focused on her side , and update the story from my side a bit here. An unplanned and unexpected ramification of bed rest for her will be that I will have about two hours added to my own day, pretty much instantly. This is because she will be in bed when I visit her for dinner in the evenings, rather than drooping in her wheelchair for two hours afterwards until she can be put to bed. I can only begin to contemplate the process of working through this change, as sudden and seismic as the change of her stroke in 2009. Of course, I have a carefully planned list of priorities for the time: my piano, three-dimensional art work, exercise. Working through how it works in practice will take time... and practice on my part. Holy cow. Stay tuned. The fence went up much more easily than I'd imagined or even hoped. 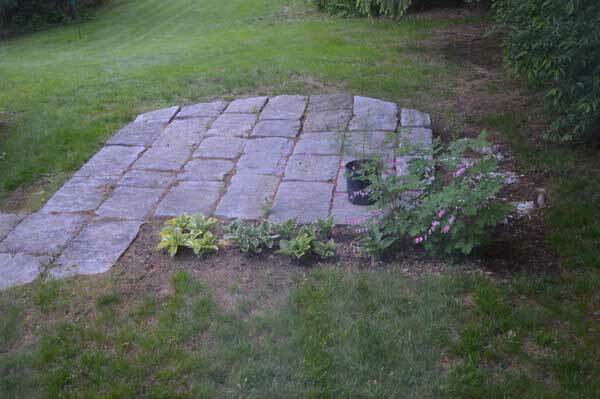 There was not a single hitch of particular significance, not even a significant stone or big root in any of the post holes. There is a 36" diameter silver maple standing right in the middle of the boundary. Last time around, the people who built the fence meandered rather loosely around it. I created a three-sided box, which seems a much more orderly approach. 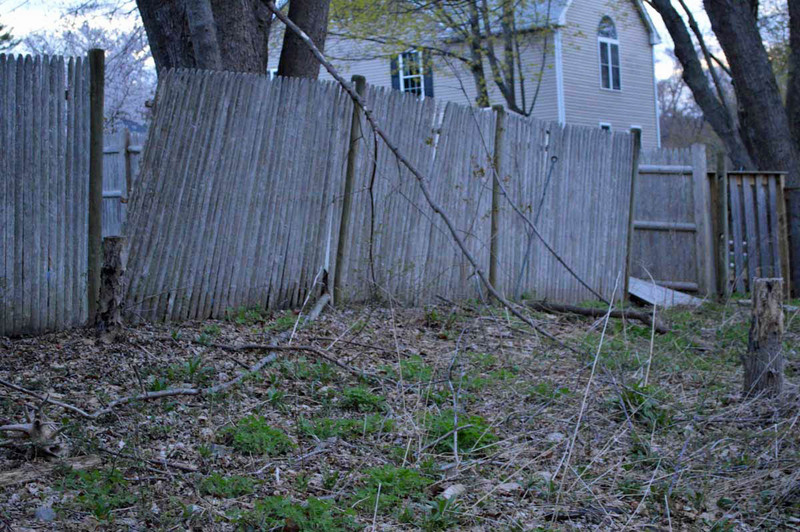 I was not surprised when recent strong winds took down a couple of sections of this fence. I’ve had my eye on it for a while. It had been growing increasingly soft and flimsy. I talked with the neighbor – an acquaintance definitely worth making – who is being very cooperative and agreeable. The plan will be for me to build a new one in the pattern of the one I did next door three years ago. The one that’s there had meandered along an uncertain line, swerving to avoid a couple of large silver maples that are just on the property line. We’ll adjust the location for the new structure. 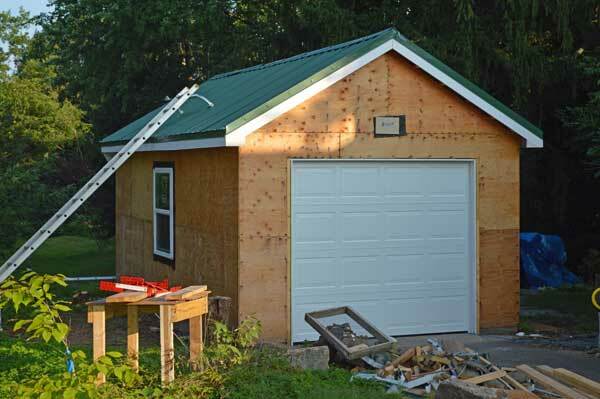 I am hoping that I can get the work done during the month of May, leaving me June, July, and August to rebuild my garage. In a way, the last thing I need is another project right now, but it’s not unexpected that the fence was going to need replacement soon. Realistically, wandering neighborhood adolescents have a tendency to wander places where they don't need to be. And it is good to have an emerging sense of where my land lies. I watched the lady in the room next to my mother’s die last week. It took a few days from the time when it had become apparent what was going to happen. All I could think was, it looked so peaceful. She had clearly been suffering and struggling, and now she was resting and relaxed. I don’t know, but I suspect she was well into her nineties. Over the years I’ve been frequenting assisted living facilities and nursing homes, I’ve observed that some people transplant well, and others don’t. My mother transplanted well; she only casually remarked of her new environment, “They have a lot more people here than they used to.” Her neighbor of last week didn’t. Somehow, the will to live seemed to fade soon after her move away from her home. I’ve seen the same with other folks a number of times. I would never make it in a nursing home, myself. That much is clear. I would much rather have peace and rest. The hostas are starting to take hold quickly, the ferns a bit more slowly. I have some areas of dense shade around my patio, screened by the house in the morning and large trees in the afternoon. This spring, as part of a program of doing a little every year, I got some hostas and ferns from White Flower Farms. They came last Monday, a slightly unfortunate timing because I'm gone from sunrise to sunset during the week. The plants were well packaged, though, and the weather was cool and damp. I dug up a bed for them this Sunday. The soil has a lot of organic material, but it also turned up a lot of cinders and ashes from the coal-burning era many decades ago. Presumably any very strong salts have long since leached away over all that time. At least I hope so. I probably will add some wood chips to help trap moisture, perhaps with a little lime to keep the acidity within bounds. I suspect it will take a year for things to get established, a second year to begin to grow, and a third to start to grow out of control. We'll see. Having watched parents with doctorates be disabled by severe dementia over the last twenty years, I have often wondered where my story goes. There are various kinds of dementia, I’ve come to know well. Most of them we don’t understand very far, and we can do precious little to treat most of them. Some are highly heritable, some sporadic. I have wanted to understand my situation, as far as that’s reasonably practical. An appreciable risk for me is of Alzheimer’s disease, in particular the late-onset variety (LOAD, as it’s often called). We have a useful degree of understanding of the inheritance of this disease. One particular protein is of special interest, apolipoprotein E, coded by the APOE gene. 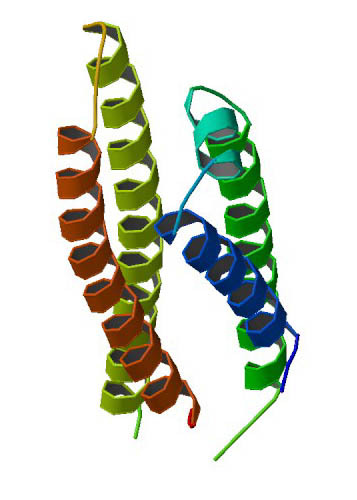 A copy of of the ε4 form of the gene from one parent about triples the risk of Alzheimer’s disease and brings it at an earlier age. Two copies make the risk about eleven times normal. Our society and our health care system have an attitude to genetics that is somewhere between ambivalent and dysfunctional. Part of this appropriately reflects mistrust of earlier eugenics programs based on misinformation and xenophobia, especially in Nazi Germany, but also in this country and societies around the world. Part of it reflects suspicion of things we can’t understand and desire to externalize illness, as Susan Sontag writes of so elegantly in her book Illness as Metaphor. Part of it is just that we haven’t figured out yet what to do with the rapidly emerging information. My own efforts to learn about my DNA reflect this ambivalence and confusion. After background investigation, I felt that the most appropriate way for me to gain information would be in the context of my health care. I discussed this with my PCP, who was very supportive, but unable to help more directly that by referring me to the group who do genetic counseling on Alzheimer’s and related disorders. I was not surprised to be told by this group that they would not do genetic testing, because Alzheimer’s is not treatable. I proceeded to order genetic testing through the direct-to-consumer route. I chose 23andMe, then the largest group doing health-related DNA analysis. Many other groups had been warned off such markets by the FDA, and the FDA not long after ordered 23andMe to cease marketing health-related DNA analysis. There are all kinds of things wrong with this picture. The first is that my physician should have been able to order genetic testing at his discretion. Granted, that the results may not be easy to interpret or to act on. That is why the gateway should be through experts, who can assess needs and appropriateness, calling on specialty help as needed. The second is that the genetic group refused without discussion to obtain testing. Leaving aside other unvoiced considerations that may have been present, let us look at the argument that we could not use the information. For starters, our health care system routinely obtains huge amounts of information that is clearly of less potential use. An example is routine testing for HDL or “good” cholesterol. Next, I would argue that we have as much knowledge of ways to lower the risk of Alzheimer’s as we have of lowering the risk of cancer by diet, with the constant media barrage of studies and claims and tips. Finally, I would argue that knowledge of one risk is useful in management of other risks. We are not immortal. No one has ever completed his or her life Alzheimer’s-free without succumbing to some other risk, when you think about it. There are certainly all kinds of things that I would choose in a heartbeat over the decade or more of the inevitable advance of dementia. As far as the FDA’s closure of 23andMe, my observation is that, if nothing else, it’s futile in the long run to attempt to suppress information. Information will out, despite any amount of effort to send us back to the Dark Ages. The FDA should help lead to appropriate paths for genetic information flow, not attempt to dam the stream. Overall, having the testing done has been very reassuring for me and is having identifiable effect in how I approach questions about my health. I recognize that others might not want to know, as I did. Notably, James Watson, the co-discoverer of the double helix, was the second human to have his entire genome sequenced – except that as a proviso, he specified that the APOE configuration be blinded to him and all others who look at his genome. The New York Times has an ongoing blog titled The New Old Age. I follow it regularly, though I seldom see anything in it that impresses me as particularly “new” or different from the age-old situation of caring for the elderly. Perhaps in our time we can put names to things, such as “Alzheimer’s disease,” that were barely defined a hundred years ago. We can do things about a small number of them, such as heart attacks or some kinds of cancer. But even if we can deal with individual illnesses and threats, we can’t do a lot about process of degeneration, of body and mind, occurring on so many different fronts. If more of us live to old age, the condition of old age remains much the same. And, as the saying goes, it’s not for the faint-hearted. The Times blog does serve the very useful function of providing a forum for thoughtful people to share their experiences and reactions. This is especially valuable because in the past people have often felt ashamed or afraid to talk about diseases they couldn't avoid or prevent, notably Alzheimer's and cancer. Such reactions unnecessarily make the illnesses much worse than they are in themselves. When something arises in our lives that we’ve never dealt with before, usually our way of dealing with it is to follow the example of someone else we’ve seen. My mother took care of my father in his declining years because, as she explained it to me, she would feel better about it afterwards if she did. I have followed her example. There were other examples around me I could have followed, including practicing the philosophy that everyone needs to take care of himself first and avoid getting “stressed out.” My mother’s approach, where family take care of each other, seemed to me to lead to a much better situation than one where everybody takes care of himself. From an abstract mathematical perspective, it’s a zero-sum game, dividing the same amount of care by the same number of people... but all of my observation is that the results of the two approaches end up with very different effects. It helped me to have seen others in the role of caregiver, and after the role was over. For instance, I could remark post-caregiving depression that was far beyond the normal bounds of bereavement. This observation has led me to work very carefully to preserve parts of my own life that I can broaden when in a while I have more time on my hands. Very recently, I came across an academic research finding that exactly this tactic was a key factor in people’s feeling of coping successfully with caregiving. As often with our lives, there may not be a lot we can actually do to make a difference, but we feel driven to try something. Very often the activities families and caregivers select are very primal ones, such as helping with food and talking. These are not a bad choice. My mother’s care package includes all food and she can’t recognize me or understand a word I say, so I’m not filling any critical gap or preserving an emotional tie. But if she doesn’t know me, I know her, and I can do things that I know will work for her. For a while, it was providing food that she could pick up and eat with her fingers, when others had long since given up on her ability to feed herself in the usual way, with table utensils. She can’t manage that any more. Now her ability to chew and swallow is unreliable, and she’s particularly suspicious of leaves and vegetable skins. This is actually a highly appropriate fear, because these have the greatest tendency to go down the wrong way. So, for instance, bananas work much better than grapes, and I use steamed apple pieces where I might have used tomatoes (or peel the tomatoes, if I’m feeling unusually energetic). It is the same way with talking. There is no intelligible speech going back and forth, but calm and interactive “talk.” She may be babbling, but I can tell from tone of voice if she’s asking a question or voicing some discontent. I try to respond appropriately, talking about some unrelated thought I’m having, but using the right cadence. It usually works very well as a way to provide reassurance and interaction. In the same vein, I do her laundry, not because the facility wouldn’t do it, but because I can keep things in better order and avoid the commercial detergents that irritate her skin. My theory is, if you don’t know what you’re doing, the next best thing is to look like you do. People will treat you better. The staff at the nursing home agree that clothes do make a big difference. It’s little things that count, not that all little things count or it’s easy to figure out which ones will. It is a very difficult notion for most people to grasp that another adult really can’t understand words. The will repeat the same phrase over and over, more and more insistently, all the while growing more frustrated that it’s not working. My mother may well pick up on the frustration and become agitated herself. A calm voice usually does wonders, no matter that she can’t understand the words. Sometimes someone else will see something that I haven’t. For example, one of the staff commented to me that it was very important not to approach my mother from the back. That was a very good insight. A noise or a touch from the back is likely to make her feel threatened, especially because she can’t evaluate very far what it’s about. The thing to do is to approach her from the front, ideally from a low position, and give her a little bit of time to see what’s happening. She seems to do best with gentle sensory stimulation, which keeps her mind from going off into its own corners, and with routine. If the routine is broken, she won’t be able to say that something in particular is missing, but she seems to sense that things are off. It’s unfortunately not economically viable for me to give my mother the full-time attention she gave to my father, since I need to keep up my full-time work. I do see her 360-some days a year, spending about thirty hours a week at it. For me, it has been an intense but broadening time. I will readily say that by expanding my horizons and making me much more conscious of a lot of interpersonal sensitivities, it’s made me a much broader person. I have also come to know many wonderful people from all walks of life who have helped take care of my mother. I hope that I will be able to stay in contact with a couple of a couple of the people after the care period. If the time is rich, it is also long. At the beginning and throughout, no one expected or is expecting that my mother would live a long time. She has proved amazingly resilient in terms of surviving. I will say, the mixture of high short-term unpredictability, very low quality of life and functioning, and very slow change have made for a picture that for a long time my mind was unable to cope with. I like to understand things, and to see some rhyme and reason in the progress of events. I’ve learned a lot of humility about my ability to see the future, which it turns out matches the experiences of some very seasoned clinicians I work with. Just about everyone would agree that my mother’s health is precarious and close to the edge, but the truth is that we don’t know how long she will live close to that edge. In a very overused phrase, I have learned to take it one day at a time, though I haven’t given up working to understand and plan. The time makes me very aware of the situation of people with special needs children. It is one thing to take care of a parent with the expectation that one’s own time after that will be the length of a generation. It is another to expect that the care of a son or daughter will continue for all of one’s own life, and to wonder and worry what will become of the child when the parents are gone. I have never particularly liked driving, so I’m interested in self-driving cars. There are early “assisted driving” features on the market now. The S-Class Mercedes sounds like it is functioning at a fairly accomplished level, but that’s maybe $100,000 over my budget. I imagine that 10 years from now, self-driving cars will be the mode. I want one that not only knows that if it’s Saturday morning, we’re going to the grocery store, but can also figure out that if the weather for tomorrow is supposed to be bad, it will be crowded this morning, so we’d better get there a little early. 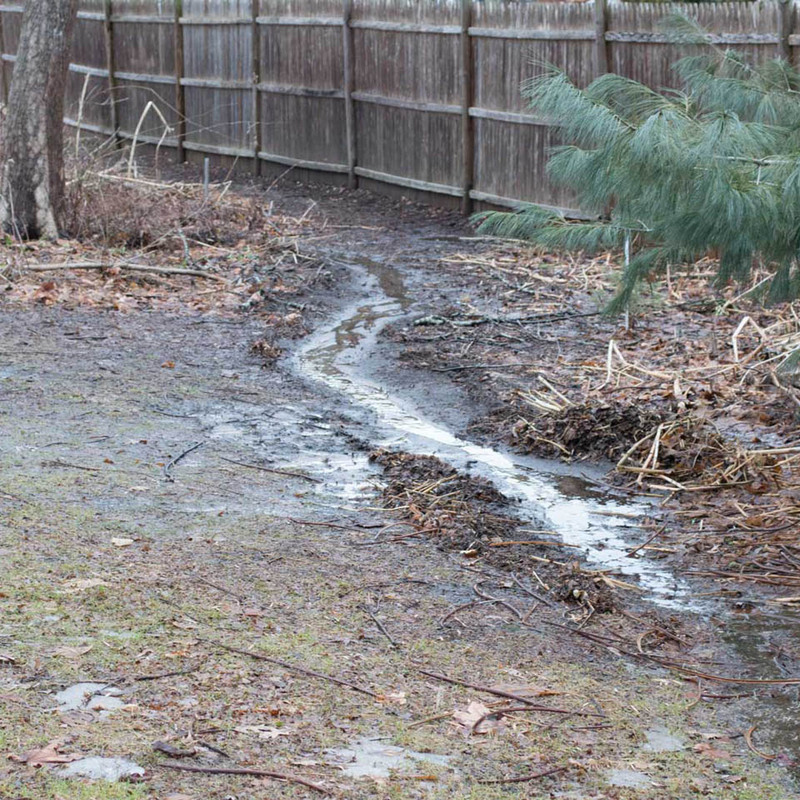 I have a vernal stream that flows down my yard for a few hundred feet most springs. "Stream" is rather a grandiose word for it; it is maybe a foot wide. Still, I like watching it when it is active. Even when no flow is visible, it's still a good feature as a path for downhill drainage, lessening puddling and soppiness. For the last dozen years, I've graded around it and fostered its feed and flow. At this point, I'm down the the point of the final hundred feet of its course. This past winter, we've had precipitation to the point that the ground is saturated, and people are more than satiated with falling water of any form. The last thing anyone would want or would argue that we need right now is a long, drenching cold rain. That is precisely what we've had. But it's an ill wind that blows no one good, and the same may be said for this storm. The best way to see the height and course of the stream is, of course, when it's quite wet. The ideal state for flow is when the ground is frozen and saturated, there's been a great rain, and the rain stops so one can go out without heavy gear for the weather. This is exactly what we had this Sunday morning, when I had the time to go out and look and rake. I have never seen so much water standing in the area. Progress seems good, but I will have to wait until the water perks into the ground to set the final grading. I don't know how long that will take. I suspect a number of days. The stream seems to be fed more by water leaching through the earth than running over it, a slow process of seepage.